Our home has become like a bed and breakfast since we moved to Tampa almost 4 years ago! It’s been so great having so many family & friends visit!! 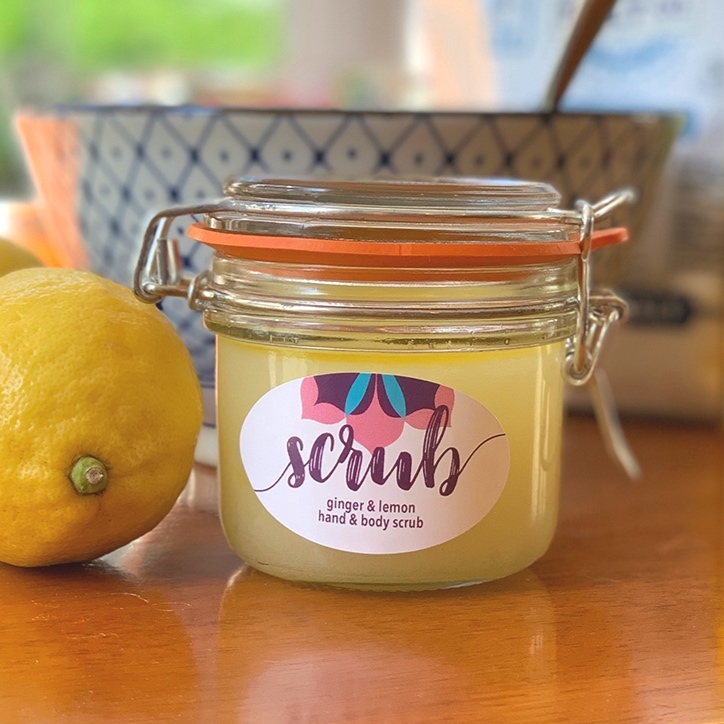 I make batches of this lemon ginger scrub to give to our guests to use when they are here. It has a wonderful scent, gets rave reviews…and couldn’t be simpler to make!! Here’s what you need; sea salt, jojoba oil, ginger essential oil, & lemon essential oil. Also, grab a bowl to mix everything in, a spoon, and a jar to store it in! Measure the salt & pour it into a non-reactive bowl. Then, measure & pour in the oil. Stir in the essential oils! Mix really well to get them distributed! Package in a cute container! Cute is important…haha! I love these little glass jars, but only use them on the countertop…they get REALLY slippery in the shower…so use caution!! Combine the sea salt and oil in a small bowl….stir it really well! Then, drop in your oils, and stir it up again. Make sure to stir for a while to get the oils distributed evenly! Scoop the scrub into sterilized jars….put on a cap and add a label if you’d like. I love to use this in the shower as a scrub, or in the kitchen after chopping onions! If you are using glass jars, they can get REALLY slippery in the shower…so use caution…OR use plastic jars like THESE. Also, make sure you don’t let water get into your scrub, or it can get harmful bacteria in it. I buy little spoons (I buy THESE). Be CAREFUL when buying oils on Amazon. There are only a couple of brands that I would recommend: Eden’s Garden and Plant Therapy are two trusted brands. There are tons of scammers out there who sell synthetic or altered oils….not great. *the links to products on Amazon are affiliate links, and I get a little money for the referral.